Love the collar to that dress girly! You look stunning as always. good luck going blonde! it'll really suit you I reckon :) hope you get better soon! I hope you get to feeling up to par soon, sweetie. Adore the darling cardigan, and I have the same shade of nail lacquer. In love with it! You're so beautiful! Love your cardigan! Love the cardigan and the colour of your nails! Love your cardigan! Hope you get better soon and can't wait to see you all blonde! Love your sweater. Your makeup and hair is amazing. Wish I looked that good when I'm sick! 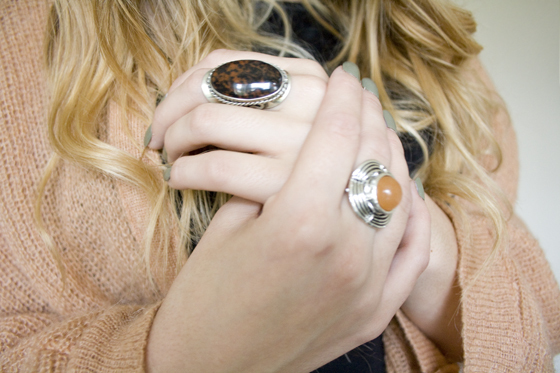 Love your nail varnish and rings. Your hair suits you. Though it does seem the ombre obsession is waning. Good luck if you go for the blondie plunge! I think you would look good as a blonde. You have a good skin color for it. Feel better, take your meds, drink fluids, being sick is the worst thing in the world. Get well soon! I love the colour of your cardigan, and your rings are lovely. Looking forward to seeing the blonde hair when you get it done! I adore this colour on you, your skin is amazing. do you have beauty tips on your blog somewhere? adore from Canadaland!! Wish I looked like this when I'm ill, lovely cardigan...very pretty! Love the nail colour with the cardi. Get well soon lovely, it just seems to be that lurgy time 'o' year again, oh joy! You look beautiful and so does your hair, so pretty. this cardigan looks just gorgeous gorgeous gorgeous <3! and i think blond is going to look amazing on you, if you ever go with it i'm supporting it! You look beautiful, especially for someone so ill! I look like a sniffly, skanky mess right now. Lucky you ;-). I love your cardigan, it looks so comfy! The cardigan is wonderful !! I hope you will get better soon ! 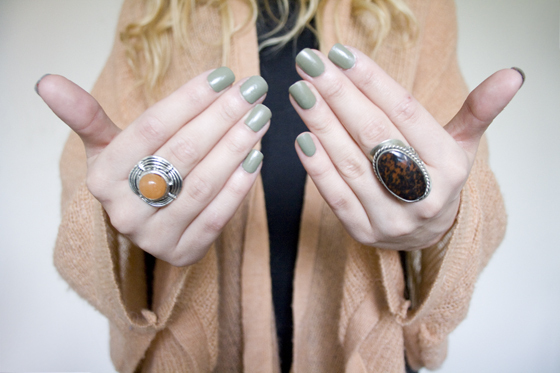 Love that cardigan and the khaki nail colour is so nice! Gorgeous, I love the cardigan ! I wanted to say 'feel better soon' but thought that's a bit mean- it's like I don't want you to get better right now, but maybe a bit later. So... I hope you get better immediately! I love that cardigan! It's such a nice colour. Love that cardigan and I cant get enough of your hair, its perfect! arw hit nails! Like it. if it's that bad now, it can only get better, right? Love the nail varnish and the beautiful chunky cardigan! It looks perfect or a duvetbay if you're not feeling well. Hope you get better soon! I have this cardi. I fell for the colour and it feels so so soft. Hope you feel better soon! Looks such a cosy outfit :). Is that dress the sleeveless one with the leather look along the top? I work there and i've not seen it on before - it looks really lovely on :). Shopping for a prom dress can leave you with traditional styles such as traditional princess dress, but if you are looking for a dress that is more risky? What if you are looking for a dress that really going to create memories that will enter the ballroom or the back? Shopping for this kind of dresses that could mean you have to leave the comfort of the clothing store formal dress and find a local network. I just absolutely love this cardigan. I need to find one in Canada! I love your blog, been following you for quite some time but now is my first comment. You're one of my inspiration. I adore your ombre hair and it looks very chic here.